Sometimes things like drones and RCs seem frivolous, or more like tools than toys. This can certainly be the case, but not always. Drones can be used for things like roof inspections, or real estate photography. In the same way, submarines with cameras can be used as a tool. For example, they can be used to inspect water tower tanks, or the hulls of ships. They can be used for underwater photography, or finding fish. Of course, they can be used for recreation too. 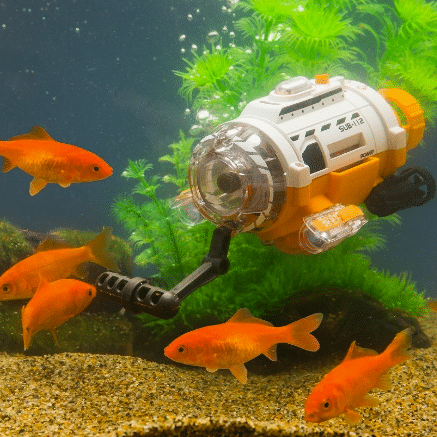 It can be fun to use an RC sub in a pool, lake, or even in your fish tank. Whatever your use for them, there are many options, and some are better than others. We put together this list of the best RC subs with cameras to help you in your search. The overall best RC sub with a camera is the AquaBotix HydroView. This is a top of the line, state of the art product that is meant for commercial uses, but is also great for recreational uses. You will not find a better product than this. This RC sub allows you to tackle any job under water. Here is a list of the potential commercial uses: evaluating the sea floor, checking lobster cages, finding out the water depth, checking progress on under water projects, marine inspection. Here is a list of some possible recreational uses: checking out the hull of a boat, watching marine life, anchor inspection, scouting fish, and entertainment. The HydroView is packed with features, which is why it is capable of performing so many functions. 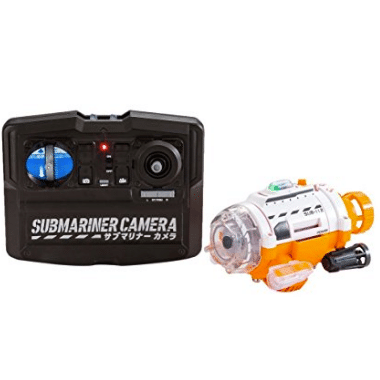 It has an 8 GB memory card that allows you to store all of your underwater video and pictures. The camera is exceptional HD quality. It comes in a convenient, lightweight, waterproof case. The unit is attached to a 75 foot cable, which allows you to easily pull it back in. The unit even has its own WiFi, allowing you to connect easily. This RC submarine also comes with free software, so you can control the unit from your phone, tablet, or laptop. 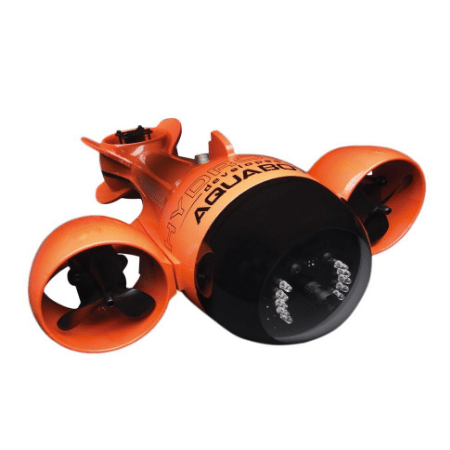 The AquaBotix HydroView is truly in its own league when it comes to RC submarines. It is rated for commercial use, and has features that you won’t find on any other unit. This is the best remote control sub on the market, and the price reflects that. The second best RC submarine on our list is the Sea Peep Sub-Mariner. If the HydroView was the best sub for commercial uses, the Sub-Mariner is the best for recreational use. It has all of the features you would want for getting under water footage, at a fraction of the price. The Sea Peep Sub-Mariner does everything that you could hope for in an RC submarine. It has great handling and control that allow you to easily navigate whatever waters you are documenting. On top of this it has a feeding arm, which will draw in marine wildlife so you can get some awesome footage. The camera is amazing quality, you can see everything very clearly. The controls on this sub are very intuitive. It uses a two channel remote, that is both easy to use and effective. Beyond its decent range, the sub has powerful LED lighting, that allows you to use it and see effectively in the dark. Although it is best for fish tanks and pools, it can also be used in ponds or lakes. 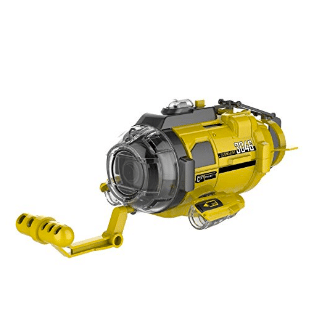 The Sea Peep Sub-Mariner is an excellent choice for anyone that wants to use a camera under water for recreational purposes. It is the best sub with a camera on the market besides the HydroView, and it is only a fraction of the price. 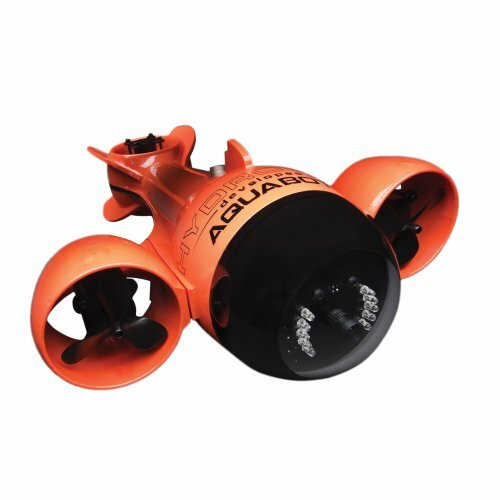 The last item on our list of the best remote control submarines with cameras is the Silverlit Spy Cam Aqua Submarine. Just because this sub is the last on our list, does not mean it is a low quality submarine. In fact, it is one of the best rated out there. The Silverlit Spy Cam Aqua Submarine is a really fun toy for a kid to use in a pool, fish tank, or pond. It has easy to use controls, and is powered by AA batteries, which makes it even easier. The sub gracefully glides around the water, in whichever direction you want it to move. This submarine comes with a detachable feeder arm, which makes it easy to get great photos of marine wildlife. Just fill the feeder arm with fish food and watch all of the fish come right up to your camera! When you are using it in a pool, it is nice to have the option of removing the feeder arm. The Silverlit Spy Cam is controlled with a 3 channel infrared transmitter, making it easy to control. This model also comes with two LED lights, allowing you to get great footage in dark waters. It has 256Mb of internal storage, which is easily transferred to a computer via usb cable. Another nice feature is that if the submarine runs out of power, it floats to the surface, which saves you from having to dive in the water to retrieve it. All in all, this is a great RC submarine. It is not as good as the other two on this list, But the insanely low price makes up for the less impressive specifications. 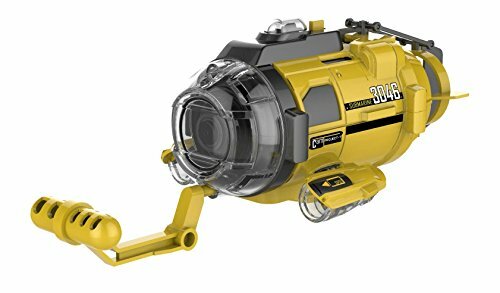 Silverlit Spy Cam Aqua Submarine with Camera, Yellow, 4.5"
Taking pictures and video underwater is more difficult than doing it above water. There are so many factors that can effect the outcome of the picture. For example, murky water can make the pictures less appealing. As well, controlling an RC sub to take your pictures with is another added level of difficulty. We included a few tips to help you get the best quality photos and video, regardless of whether you are inspecting the bottom of your boat, or checking out marine wildlife. 1. Be as close as possible to the subject of your photo or video, as murky water will make the quality less clear. 2. If your RC submarine has a flash feature, turn it on. Alternatively, if it uses LED lights or some other lighting system, make sure it is turned on. Being under water can make the environment seem darker than it actually is. Using flash or lighting will help counteract this. 3. Instead of aiming down while taking a picture, get a shot of the subject from below, this will create a superior picture. 4. Get practice with controlling the submarine first, before trying to take pictures or video. Being more skilled with navigating through the water will help you position yourself better for the perfect shot. 5. 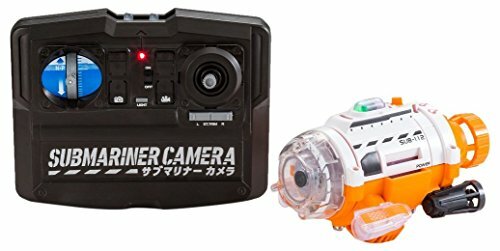 Figure out how to take good photo/video above water. Understanding the basics of photography will be a major benefit in capturing life below the water. 6. This should go without saying, but if your camera has multiple settings, make sure it is set to the highest quality. Some cameras have different quality settings, all the way up to HD. Using a higher resolution will obviously make the picture come out better. 7. While shooting with sunlight as the lighting, take footage within 20 feet of the surface. As well, make sure the sun is behind the camera. Sunlight only penetrates the water so deep, so make sure that you are within a range that will provide decent lighting.